Benedict Olugboyega Alabi was born on July 12, 1965 at Catholic Hospital, Oluyoro, Oke Ola, Ikire to the family of Late John Oyeyemi Alabi and Late Eunice Atoke Alabi both from Ikire township. His father Late John Oyeyemi Alabi was a thoroughbred civil servant and the first graduate from Ikire. Late John Oyeyemi Alabi took over from the white district officers (DO) of Ikire district office after Nigeria independence. For his thoroughness, love for his people and exemplary performance as District Officer, the people gave him the nick name "Oyinbo Dudu". Olugboyega Alabi's Mother Eunice by name, was known in her vicinity as an astute business woman. She lost her husband at a tender age of 45 and was faced with task of fending for her immediate family of nine(9) children and numerous dependants who are relatives. He business engagements spanned from, bakery (Olugboyega Bread between 1965 and 2000), intercity transportation named "Ibukun Oluwa transport" between 1970 and 1975, Easy life bar between 1965 and 1977, Atoke farms from1970-to date, Golden Penny and Nigeria Bottling Company distributorship 1970-1977to a few others. At the age of 90, Madam Eunice died in 2012. 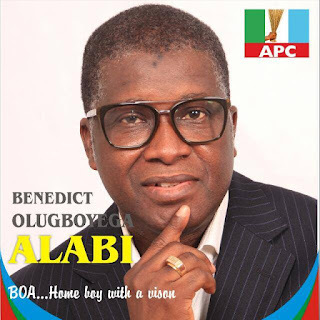 Coming from this background of an hard-working family and a stunt Catholic values, Benedict Olugboyega Alabi attended Holy Cross Catholic Primary school, Ikire between 1971 and 1977, Baptist Grammar School, Ikire between 1977 and1979, and Lagos African Church Grammar School, Ifako - Agege. He came back home and proceeded to Baptist High School (Adeke Height), Iwo for his A' Level education between 1982 and1983. Unfortunately, the young Alabi had to abandon his A' Level studies in 1983 due to financial reason and settle for the Ibadan Polytechnic to study, Banking that same year. In Ibadan Polytechnic, at a tender age of 18, Benedict Olugboyega Alabi was elected the Vice President of the Polytechnic Charter of Jaycees International and also the Financial Secretary of Federation of OYO State Students. He is a fellow of Chartered Institute of Bankers of Nigeria, a Fellow of the Institute of Credit Administration of Nigeria, a Fellow of the Government Institute of Research and Leadership Technology (with specialisation in Strategic Management). Benedict Olugboyega Alabi is the first African to be qualified and awarded the Sustainability Facility Professional (SFP) Certification by the International Facility Management Association, Houston USA. Gboyega as he is popularly called has worked in managerial levels of few banks in Nigeria and the last was Sterling Bank before the establishment of Eliezer Group of Companies. He was the pioneer Group President and Chief Executive Officer of Eliezer Group, the company he started from nothing to be leader in facility management industry in Africa, with offices in Ghana, Cameroon, Kenya, Uganda to mention but few. He also ventured into Agriculture. For his love for his people, social welfare and humanity, Benedict Olugboyega Alabi is also floating an empowerment foundation named "Osun Ajose Foundation" with a view to stamping out poverty among the people. Quintessentially, Benedict Olugboyega Alabi is adored by all, and that has been his greatest happiness.